Best Website to Free Download Khalistan Songs. Bhai Balwant Singh Rajaona is currently Patiala Jail, serving a sentence for his involvement in the execution of then Chief Minister, Beant Sinh outside the Punjab secretariat in 1995. Bhai Balwant Singh Rajoanna was announced to be executed by hanging tat has been set for March 31st, 2012 for his alleged association with Shaheed Bhai Dilawar Singh Babbar and Bhai Jagtar Singh Hawara who were responsible for bringing the ex-Punjab Chief Minister Beant Sinh to justice, on August 31st, 1995. Although his death sentence was capable of appeal, Bhai Rajoana instead willingly expressed his desire to be put to death instead of showing any faith in the widely acknowledged to be corrupt Indian justice system. Despite Bhai Sahib's willingness to embrace Shaheedi (martyrdom), it is everyone's duty to raise our voice against this injustice and save our fellow Sikh brother. I am writing to express my deep concern that it was confirmed on 13th March that India is preparing to break its moratorium on the death penalty by hanging Balwant Singh on 31st March at 9am in Central Jail, Patiala. 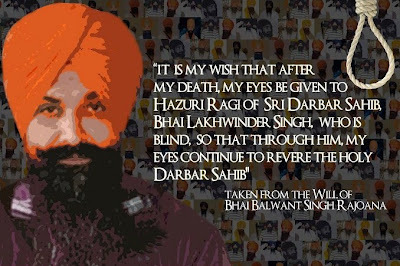 Balwant Singh was a close friend of Dilawar Singh, a serving police officer in the Punjab Police who in 1995 killed the then Chief Minister of Punjab, Beant Singh, who was responsible for the mass genocide of the Sikhs in the 1980s and early 1990s. In recent years Amnesty International has welcomed the lack of executions in India, with the last one taking place in 2004, but expressed its concern that at least 50 death sentences are passed each year by the Indian courts. By making this announcement India is signalling to the world that when it comes to Sikh prisoners it is prepared to break the moratorium and reverse the trend to abolish the death penalty. There is a real risk this may open the flood gates and allow India to execute the likes of Professor Davinderpal Singh Bhullar. His case has been highlighted by Amnesty International and raised with UK Parliamentarians on a number of occasions. He has now been in prison for over 17 years and been on death row in Tihar Central Prison, New Delhi for over nine years. This most recent announcement also comes on the back of the pre-mature release last month of Kishori Lal, who was awarded the death penalty in the murder of three Sikhs with a chopper knife on 1st November 1984. Many in the Sikh community feel the Indian authorities are blatantly targeting Sikhs and many countries around the world may stay silent as they do not want to jeopardise trade with India.